This design used two bottles of polish (similar to my NAIL ART COMPETITION THAT YOU SHOULD DEFINITELY ENTER), Decoded from ORLY and Twiggie from Color Club. I also tried some new and interesting techniques. 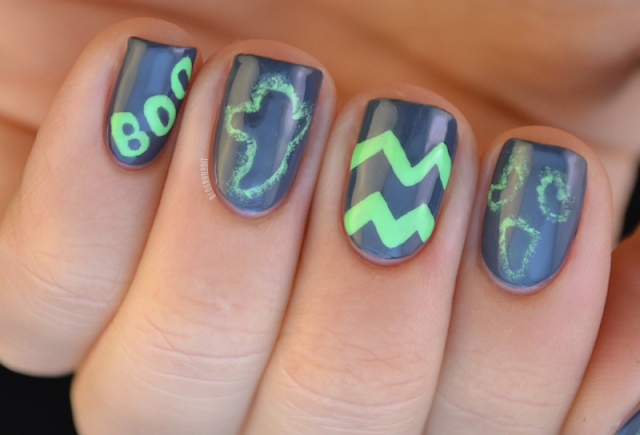 The chevron pattern and "Boo" were both done freehand. No big news there. However, the scream face and ghost figure were actually something new I've never done. First, I got a makeup sponge and dabbed a small amount of Twiggie onto the sharpest corner of the sponge. Then, I lightly dabbed a rough outline of the shape of the ghost, eyes, and mouth. (It helped to draw the pattern out on paper first to get an idea of the shapes needed.) When Twiggie had dried, I used a small striping brush dipped in Decoded to draw a clean outline of the shapes over the patches of green. Without a topcoat, this looked strange, so you really need to smooth it all out with a nice layer of topcoat. With that last layer of topcoat added, it really pulls together nicely, wouldn't you say? I love the little ghost... so perfect! Was Twiggie the neon green? This is so cool! I love the scary face on the pinky! Cool! I love these two colors! the little ghost looks brilliant, love the colour contrast! That ghost is so great!